Radiation from cell phones and wifi, it’s not something we really think about, is it? Are we travelling the same road we did with regards to smoking? When everybody thought it was ‘ok’ and assumed there were no health hazards? Hopefully not, but science seems to be pointing in that direction, as multiple scientists are raising their voices trying to tell the world how cell phones, cell phone towers, radio frequencies and more are affecting our health in more serious ways than we thought. There is no doubt about it, electromagnetic fields (the radio waves emitted from various appliances like cell phones and computers) are hazardous to our health. How do we know this? Well, we know this because a large group of internationally recognized scientists has appealed to the United Nations, urging them to consider the dangers associated with using electromagnetic devices. One of these scientists is Dr. Martin Blank, Ph.d., and a professor in the Department of Cellular Biophysics at Colombia University. Below is a video of him outlining the dangers associated with these devices. As far as what this stuff is doing to your child’s brain, take a look at the picture below. These are brain scans of people who spent a few minutes talking on their cell phones. 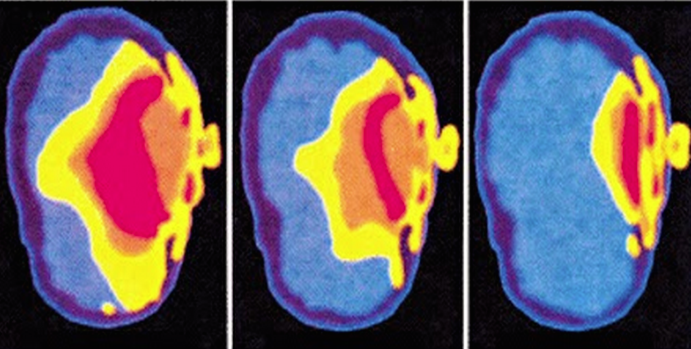 On the right, the adult brain absorbed a decent chunk of radiation, but to the far left you will see a child’s brain, which absorbs more than 4 times the radiation than that of an adult.